The Sea of Marmara was bathed in fog with just the tips of minarets, skyscrapers and the suspension towers of the Bosphorus bridge poking through as we rode out of Istanbul. We turned right onto the bridge and it felt as though the Silk Road had begun in earnest. Early morning traffic was light through the suburbs and out onto the motorway to make 200 quick kilometers to the hills. Then some great twisties on good surfaces and we emerged to ride past one of Turkey's largest steel works belching steam, smoke and dust. A few more miles and we arrived at our overnight stop. A genuine caravanserai called the Cinci Han. These fortified inns provided secure stops on the Silk Road. A bit like modern motorway services but with thicker walls. Merchants would bring their camels into the central courtyard, offload their goods into the cellars and stop for a few days to rest or trade. 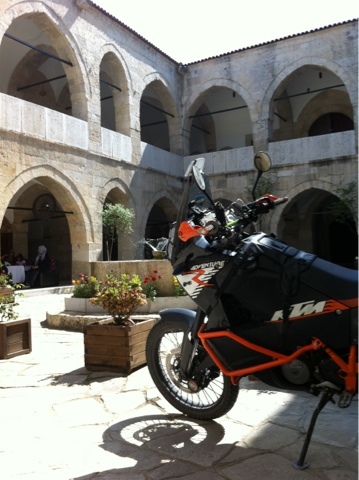 Today's picture shows Chris and Susie's much maligned but very lovely KTM giving a modern take on the camel. The town of Safranbula is all Ottoman houses and steep streets with the caravanserai and mosques providing the focus. Atmospheric and wonderful.